Corporate special interest groups have hit upon a very powerful framing of the economy and government that involves something they call “redistribution”. It has been played over and over in the media more than any annoying pop ballad I can remember. So much so in fact that I bet you could describe the framing w/o me saying a word. You earn your money. It is yours. Then the government takes it away in the form of taxes (often referred to as theft) and gives it to someone who hasn’t earned it (redistribution). When people you know say “socialism,” it is this process of taking from the “deserving” to give to the “undeserving” they are talking about. I state this argument as strongly as possible here because this is what we’re up against. Professional, audience-tested propaganda. If we, when you are talking to people, fall into arguing the side that wants to “redistribute,” you will be seen as someone who wants to use government to take away and give to the “lazy” or “undeserving”. There is an easy way to flip this framing and talk about the actual situation with people you never thought you could reach. All you have to do is talk about distributing it right to begin with. This is a classic example of a corporate special interest group divide-and-conquer strategy. 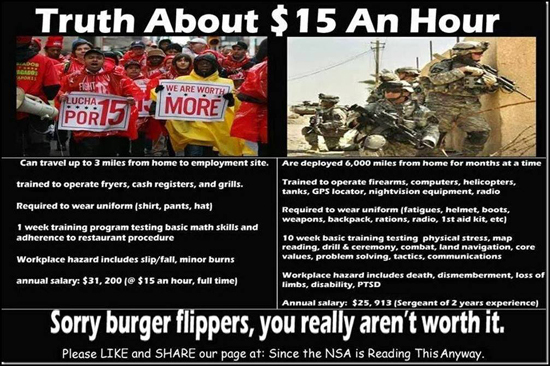 Take the issue of people not being paid well and turn it into fast food workers vs. the military. In this frame, the implication is strong that if you support one, you don’t support the other. 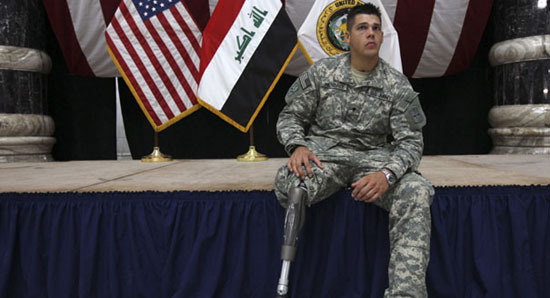 I suggested maybe our troops should make more too. I don’t understand why it’s one group versus another. Whether it’s the army or fast food restaurants, the issue is the same: people aren’t being paid very well. What is happening is that all the profits of our work are being funneled to the top. The best example of this I’ve seen was brought up recently by Bernie Sanders. I mentioned this to my friend and asked, isn’t something wrong when so much is being funneled to the top? One of the analogies I like to use in talking about the economy is a pirate ship. Some of the roles on a pirate ship include: captain, first mate, cook, surgeon, sailors, gunners, cabin boy, cooper, and so on. Imagine that you capture a British ship with 1,000 gold coins. If there were 40 crew members, how should it be divvied up? What should the people who funded your ship receive? What would be fair? Relate this to a recent division of wealth in the United States. In 2010, the top 1% had 35.4% of the net worth in the United States. The next 19% held 53.5%. The bottom 80% or 32 lowest ranking crew members would have to split 111 gold coins this is roughly 4 coins apiece. On a real pirate ship, would the captain have been able to divvy up the wealth this way in front of the crewmen without getting keelhauled? So how is it that wealth generated by the United States is so unequally distributed? Outsourcing – Companies outsourced jobs to countries with cheaper wages and less benefits. This puts downward pressure on American wages. Technology – What technologies does the private sector invest the most in? Technologies that increase productivity subsequently enabling companies to do more with less people. Temporary workers – Companies shifted portions of their work force to temporary employees allowing them to skirt labor laws and regulations. Shifting the burden – Tax laws were re-written so that the wealthy pay less through loopholes and exemptions and everyone else pays more. Examples include: lower taxes for income generated by capital gains, a rise in regressive taxes such as sales taxes, increases in property taxes, and straight up loopholes and exemptions such as the cap on paying into Social Security. Destruction of the public sector – Well-paying government jobs that put upward pressure on wages are being eliminated through outsourcing (Exs. the military and public schools). Legislation – Corporate special interest groups are passing laws such as Right to Work legislation that helps companies defund and break up unions. Propaganda – Corporate special interest groups have invested heavily in getting out a story that says if you give to the top, the benefits will “trickle down.” Only they don’t. Divide and conquer strategies – Democrats are pitted against Republicans. Whites are pitted against blacks. People are pitted against immigrants. The religious are pitted against the non-religious. Straights are pitted against gays. Hate and fear are constantly stoked to hide the real looting of our country. 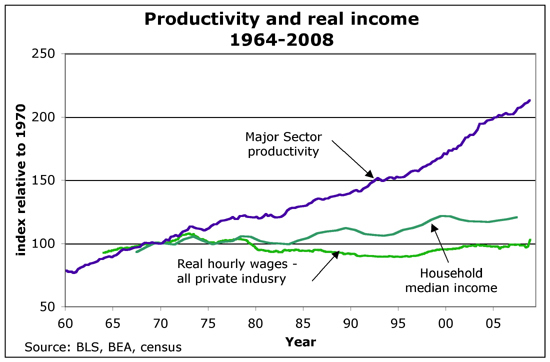 The net result is that even as productivity continues to increase in our country, wages have remained stagnant for everyone but those at the very top. Now corporate special interest groups will tell you that all of this is a natural progression and there is nothing people can do about it. Of course at the same time, they tell the people who support them to vote and speak up as loudly as possible. We can change things. Enough people just have to speak up, act, and vote for an economy that work for more people. We have a choice. We don’t have to build a system that continues to funnel more and more from the many to the few. People should share in the rewards. To do this, however, we’re going to need to bring back values. Values like fairness, and justice, and democracy, and equality. We want a country that does what’s right, instead of what’s going to make some small contingent the most profit. 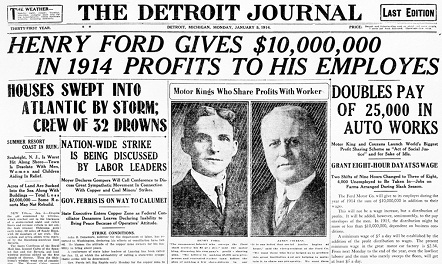 Henry Ford believed that if he paid workers well they would have enough to buy cars and this would eventually increase his business. It did. Unions – Business Insider just ran a piece entitled “Why It’s Time for Labor to Organize.” Our economy over the past 40 years has shown that owners will do everything they can to maximize the flow upwards. I don’t believe this is because they are evil. I believe it’s because we have a system with no responsibility. Maximizing shareholder value has become a religion. CEOs claim this is what they’re doing, ask the shareholders. The stock market rewards more profitable companies in the short term. In the long term, however, this lack of responsibility tends to destroy value. Unions would help bring back responsibility. 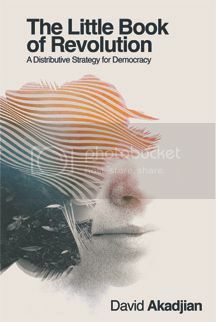 Money out of politics – Corporate special interest groups have discovered that they can generate big returns politically. Fund a few campaigns and politicians will pass legislation to put downward pressure on wages and even shift the costs of business onto workers. Remove the money from politics and the incentive for politicians changes to working for people. A living wage – When people earn enough to have a decent life, the overall economy benefits because more people can participate. Rules – A working economy has rules. It is not an anything goes free-for-all. It’s more like a system of traffic lights and signs, which ensure traffic isn’t a chaotic mess. Information needs to be equal between transaction participants. Because we create the economy, we create the rules. We can either do this so a few people benefit (the current situation), or everyone benefits. These rules should be the same for everyone. Competition – Government has the power to break up monopolies and oligopolies. Public investment – Advanced technologies are risky investments. As such, public equity is needed for investments in infrastructure and to bootstrap new technologies. Private equity tends to make less risky investments such as protecting existing monopolies. Private equity makes competitive investments, public equity makes investments in things that are good for everyone. Equal regulation – Businesses, rightly so, will tell you that they want a level playing field. By this, they mean that other companies shouldn’t have an unfair advantage. The unfair advantage could take the shape of less regulation, lower taxes, a cheaper workforce, etc. What we are typically told is that regulations are bad, taxes are bad, and employee costs are bad. This is a special case of equal regulations called “no regulations”. This is a race to the bottom. Instead of a race to the bottom, we should be raising regulations and standards, equalizing taxes, and raising wages and benefits. Sustainability – A working economy has to be a sustainable economy for it to still work for future generations. Paying it forward The idea behind a progressive tax system is that those who benefit the most from our country pay it forward so the next generation can benefit. I’m sure there’s other aspects as well. The goal here isn’t to describe everything but to help paint a vision of what a better economy would look like. The reason for doing this is that if you can help show people what something better looks like, it not only helps to take away the fear, but it inspires confidence. All of this is not only possible, but doable. What is holding us back from doing it is the tremendous amount of money being spent in favor of our current system that benefits the top 1% (more accurately the top .01%). The extremely wealthy fund corporate special interest groups and think tanks that devise propaganda that makes it seem “wrong” to work towards a better economy. They say that this would be “redistributing” the wealth and equate this to theft. Their strategy is to divide workers against each other and get them to fight for an ever smaller piece of the pie. Since the billionaires are using a divide-and-conquer strategy and trying to get people to play the capitalism/socialism game, change the frame and talk about what a working economy should look like. When someone tells you that we shouldn’t be “redistributing wealth,” don’t fall for the bait. Talk to them about how we should be distributing it right to begin with. Ask them if they think it’s fair that 14 people increased their wealth by $157 billion while the rest of the country struggles just to get by. Help them understand that if more people earn more money, greater demand and circulation benefits everyone.